Friendship, I am blessed to have known it and I treasure my friends. To me the value of my friends is far above rubies. I grew up loving Anne of Green Gables. In real life, our beloved dogs are named Gilbert and Minnie Mae as a testimony to my love and devotion to Anne and one of my all time bucket list wishes is to visit Prince Edward Island. 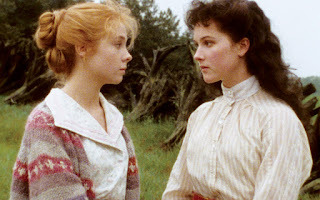 An aspect of the early Anne of Green Gables stories that I adore is Anne's loyal friendship to Diana Barry. She loves Diana with her whole heart, she is her bosom friend. "A bosom friend" Anne explains to Marilla is "an intimate friend, you know - a really kindred spirit to whom I can confide my inmost soul". I never thought Diana was good enough for our Anne, but after Diana is invited to tea with tragic results and the girls are forced to say an eternal farewell there is no denying their love for each other. "Ten minutes isn't very long to say an eternal farewell" said Anne tearfully. "Oh, Diana, will you promise faithfully never to forget me, the friend of your youth, no matter what dearer friends may caress thee?" "Indeed I will," sobbed Diana, "and I'll never have another bosom friend--I don't want to have. I couldn't love anybody as I love you." "No." Anne drew a long breath. "I thought you liked me of course but I never hoped you loved me. Why, Diana, I didn't think anybody could love me. Nobody ever has loved me since I can remember. Oh, this is wonderful! It's a ray of light which will forever shine on the darkness of a path severed from thee, Diana. Oh, just say it once again." "I love you devotedly, Anne," said Diana staunchly, "and I always will, you may be sure of that." Are you crying .... oh my goodness I am!! The point I was trying to make, before getting deliriously swept away in the beauty and romance of Anne of Green Gables, is friendship is such an important aspects of life. Sometimes I find my life quite repetitive, very similar tasks over and over. Also my life feels quite mundane, I am committed to loving my God, husband, family and planet but there is nothing headline grabbing about this, it takes a lot of small acts of kindness that I hope will one day add up to a life lived with love. However, if I were able to line up and parade before you MY friends well .... I know you, and in fact the world, would be impressed. My goodness, the people I get to call friends are the finest folk you could ever hope to meet. They have strength of character and determination of iron, their hearts are as big as the ocean and they love beyond belief. They are passionate and caring and kind and funny and hard working and beautiful and I love them so. There was a time in my life when I was reckless with friendships but no more. My friends do truly mean the world to me. They shine bright sparkly glitter on even the dullest day and I feel truly blessed and to know and love them. I do not want to give the impression that there are hundreds of people in this clan I talk of, probably be lucky to be pushing twenty and some friends I see daily or weekly or monthly or annually, but this does not have any effect on the depth or importance of our friendship. So I would like to make a toast to all the Anne and Diana friendships out there, may your friendship live long and prosper. be well rounded and supportive.